What is a Nature Playscape? 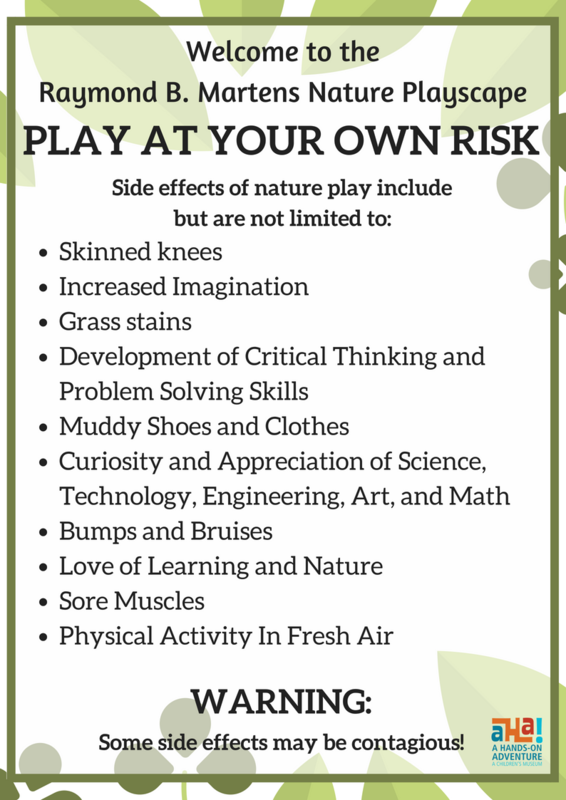 Nature Playscapes are outdoor spaces that are carefully created to facilitate nature play in a way that encourages risk-taking, exploration, and hands-on learning. Unlike playgrounds, Nature Playscapes use natural materials such as wood, sand, stone, and grass to immerse young children in nature. The goal of Nature Playscapes is to inspire children to become life-long nature enthusiasts with an appreciation for conservation. The Raymond B. Martens Nature Playscape was designed to provide children with a challenging and stimulating environment away from technology. The Raymond B. Martens is a part of the AHA! Children’s Museum, guests who wish to visit must show a valid membership card or pay the daily admission rates. The playscape is intended for self-led family experiences. Accompanying adults are solely responsible for their children and must be present at all times. Occasionally, staff will be available to provide special programming activities or to assist in emergencies. All of the playscape materials are intended to be touched and manipulated. Please be prepared for your child to get dirty and wet. Before reentering the museum, visit our sand station to prevent sand and mud from tracking inside. We encourage families to enjoy their snacks and lunches at our outdoor tables but we ask that you please respect the space by discarding all trash in the proper receptacles. There are no restrooms in the outdoor space, please visit the restrooms located inside the museum for all diaper changing needs. In an effort to maintain the natural habitat, please be gentle with any bugs, animals, or plants found on the property. Observe all posted signs as they are there to guide and inform you during your experience. Donations of all amounts will help support the outdoor space! Click on the DONATE button above to go to our PAY PAL Account and Donate TODAY! We are a 501c3 nonprofit and your donation may be tax deductible.